It looks like Floyd Mayweather Jr is not joking when it comes to his MMA intentions. Tyron Woodley, current UFC Welterweight champion, plans on showing him some moves soon. Who knows, with such a good wrestling performance, Floyd might actually go all the way. Currently, nobody is sure how far Floyd Mayweather Jr is ready to go, but training session with “The Chosen One” might mean he could defeat even some of the toughest names if he is able to keep the fight standing. Dominick Cruz stands by Mayweather’s side. Even while retired, Floyd remains a very busy man. However, despite he might lack in time, many people believe he needn’t train that hard to be successful in the Octagon. Basically, he should only be able to defend takedown and submission attempts. 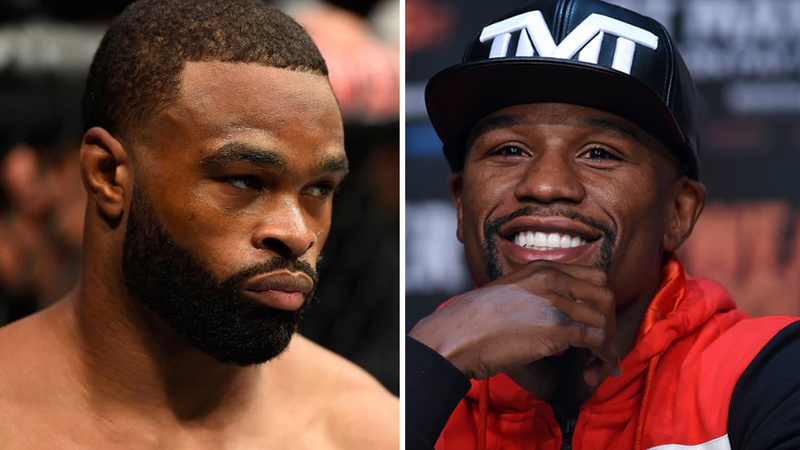 Maybe the tip of the iceberg could start melting if Floyd Mayweather Jr really starts training with Tyron Woodley. In the case that happens, it will be a hot topic every single day. Mayweather could brag so much about that and get the higher media attention than Conor McGregor. Do you remember how Conor McGregor proclaimed himself The King Of Boxing? What would happen if Floyd Mayweather Jr starts saying he is The King Of MMA? Be sure he would trash-talk and provoke some of the biggest names in this sport. Stay tuned!